In situations where business needs go beyond reports and data, MDDetails offers consulting services tailored to your specific issues and questions. Our staff is comprised of seasoned experts with deep clinical and commercial experience able to work with you to develop and deliver actionable insights. We typically work directly with medical affairs and sales & marketing organizations, but are comfortable engaging with other functional areas as well (e.g., clinical, competitive intelligence, and operations). 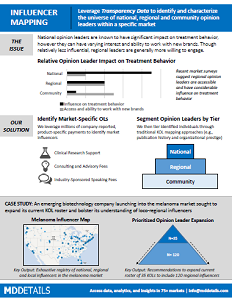 National opinion leaders are known to have significant impact on treatment behavior, however they can have varying interest and ability to work with new brands. Though relatively less influential, regional leaders are generally more willing to engage. We review company-reported, product-specific interaction data (e.g., research, consulting, speaking) to identify influencers. We then tier identified individuals through traditional KOL mapping approaches (e.g., publication history and organizational prestige). 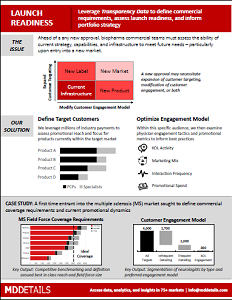 Ahead of any FDA approval, biopharma commercial teams must assess the ability of current sales & marketing strategy and field capabilities to meet future needs – particularly upon expansion into a new indication or entry into a new therapeutic area. We perform competitive benchmarking to assess promotional reach and focus for products currently within the target market. Within this specific audience, we then examine physician engagement tactics and promotional metrics to inform best practices. Practice consolidation and physician “no see” rules are challenging biopharma’s most effective sales tool. At the same time, new and complex therapies necessitate a need for face-to-face interaction, making it paramount to understand rep access at the physician level. We leverage millions of company-reported promotional payments to measure accessibility at the physician level. 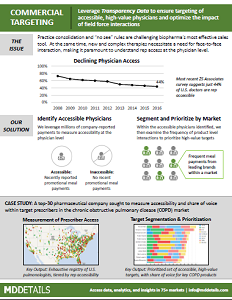 Within the set of accessible physicians identified, we then examine the frequency and type of product-level interactions to prioritize high-value targets.